Manchester City can become the first team in Premier League history to reach 100 points in a single season, says Chelsea manager Antonio Conte. The runaway leaders, who need five wins from 10 games to claim a third title in seven seasons, are on 75 points. Chelsea, who visit City on Sunday (16:00 GMT), hold the record for most points after reaching 95 in 2004-05. "They have the possibility [of reaching 100 points] because they're showing to be the best in the league," said Conte. 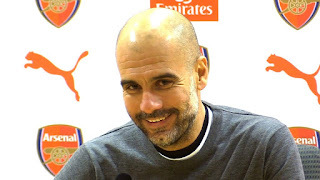 The Italian, who won the title with 93 points last season, added: "If they continue with this fire, with this hunger, for sure they can achieve this result. It won't be easy." Pep Guardiola's City are 15 points clear at the top and will finish the campaign on 105 - 10 more than the current record - if they win their remaining 10 games. As well as Chelsea, they still have to face Manchester United at home on 7 April and Tottenham away on 14 April.